SAN FRANCISCO (May 17, 2017) — The New York State Office of the Attorney General, in consultation with the offices of the Attorneys General of California, the District of Columbia, Oregon, Rhode Island, and Washington, has released a new report outlining what the law does – and does not do – when it comes to federal immigration enforcement. Federal law does not compel state and local governments to participate in federal civil immigration functions, nor could it under the Tenth Amendment to the United States Constitution. Local law enforcement agencies do not violate any law when they decline to fulfill an ICE detainer request. ICE detainer requests are voluntary. There is no obligation for local law enforcement to comply with them, which the U.S. Department of Justice has repeatedly acknowledged in court. Local law enforcement agencies that decline to detain individuals pursuant to ICE detainer requests do not, on that basis, violate 8 U.S.C. § 1373, the statute that the federal administration has used in its effort to cut off federal funding to jurisdictions. Our system of federalism gives state and local governments substantial autonomy to formulate policies and practices to protect their communities, including how to expend limited taxpayer resources on law enforcement activities. 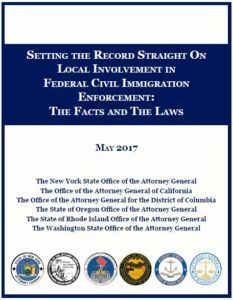 Lawfully limiting local law enforcement involvement in federal civil immigration functions can enhance public safety, including by enabling law enforcement to focus their limited resources on combating serious and violent crime in the communities they serve, and by facilitating greater community cooperation with the justice system.